"In the US, you have to be a deviant or die of boredom." William S. Burroughs, one of the three seminal writers of the Beat Generation (the other two being his friends Jack Kerouac and Allen Ginsberg), was born in St. Louis, Missouri, on February 5, 1914, to the son of the founder of the Burroughs Adding Machine Co.
A homosexual in an extremely homophobic age, back in the U.S. he drifted from job to job while continuing his education as an autodidact. He lived in Chicago, where he was an exterminator, which he claimed was the best job he ever had. 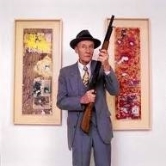 By the late 1970s Burroughs had lived long enough to be hailed by critics and the public as a major American writer. He was embraced by punk rockers in New York and became an iconic figure by the 1980s. He died in 1997 at the age of 83. Based partly on William Burroughs book Naked Lunch with ideas from other novel of his (Queer / The Exterminator). This documentary reveals a much different Burroughs than one might expect. He’s serious. Only occasionally letting some of his sick humor out. He’s organized, neat, and clean. He’s on a methadone maintenance program, not heroin. He’s frail instead of thin, like he was. His voice is thin, wiry, and high-pitched. All nasal, no throat. Basically, he sounds like a geezer. (And, from what I can tell, he’s always sounded like one). You discover very little about Burroughs, from Burroughs. He seems to prefer droning monologues to clear speech. But luckily, Burroughs’ friends and family do a lot of the explaining. They provide the necessary context and commentary that is missing from Burroughs’ dry facts, robotic speeches, and comedy routines. In the end, the documentary gives us many different views of Burroughs as an author, all of which help us understand his weird life and weird books. This documentary is a straightforward, chronological examination of the writer's life. If you're a fan of the 'Naked Lunch' author, you'll love every minute of "Burroughs". Beyond the standard examination of Burroughs's writing techniques and the themes that informed his work, you get an intimate glimpse of the man himself. Director Howard Brookner celebrates the author's merits but is not afraid to expose his flaws, either; the footage of Burroughs and his ailing, doomed son(also a writer) attempting to carry on a conversation is agonizing. "Burroughs" is by turns frightening, funny, and sad. See it if you can find it. The copy I have of this excellent documentary is a computer download and if ordered will be supplied on CD as an AVI file (playable with most media players). The reason is that if copied to DVD and shown on a large TV it looks blocky, but on a PC screen it's OK. This is a collection of rare interviews, documentaries and avante garde art pieces.